The symmetry between Sean Dyche's first game in charge of the Clarets and his 300th are uncanny. Back on November 3rd, 2012, the former Watford boss' introduction to Turf Moor ended in a 2-0 win over Wolves courtesy of goals, in either half, from Martin Paterson and Charlie Austin. Fast forward to the present day and yes, you guessed it, a goal in either half secured the same result against the same opposition to bring his time in charge full circle. 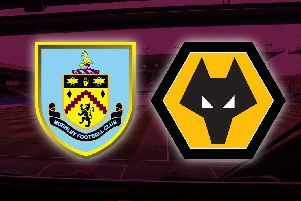 There was very little between the two teams in the first half, but it was Wolves skipper Conor Coady's desperately unlucky own goal that put the Clarets ahead at the break. It was just the start that the home side needed after four defeats on the bounce, and it was the type of fortune that had been evading them in recent weeks. Quick thinking from Dwight McNeil in the second minute created the opening, as the England Under 20 international clipped his set-piece around the outside of the Wolves backline, and Chris Wood took care of the rest. The New Zealander's first touch took the ball away from goalkeeper Rui Patricio and his effort came back off the post, ricocheted off Coady and crossed the line. It was just what the doctor ordered for the Clarets, who survived the remainder of the half without a scare. Phil Bardsley sent a shot wide of the target from distance, Ruben Neves failed to test Tom Heaton when attempting to replicate one of his many wonder strikes and the England goalkeeper snuffed out the danger when claiming at the feet of Diogo Jota from Ivan Cavaleiro's through ball. Wolves had the lions' share of possession in the second half and Nuno Espirito Santo introduced leading scorer Raul Jimenez to give their hopes of taking something from the game a shot in the arm. Jota sent an effort just wide of the far post when cutting back on to his right boot and Cavaleiro should have done much better from Leander Dendoncker's pull back when finding the stand from close range. The hosts continued to throw themselves at everything in front of them in a bid to preserve their slender advantage and James Tarkowski's block from Jota was the pick of the bunch. And then a flying save from Heaton, shifting his body weight over to his right hand side, prevented Jonny's header from finding the back of the net. Burnley were dogged but, ultimately, they were hanging on for dear life against the FA Cup semi-finalists. It needed something special to settle the nerves. Step forward McNeil. Following a prolonged period of possession, a rarity in the second half, the 19-year-old moved the ball on to his favoured left foot and picked out the far corner from the edge of the area. Substitute Matt Doherty headed over from Joao Moutinho's cross late on but Dyche marked his milestone with a much needed win to push the Clarets five points clear of the relegation zone in the Premier League.